eCommerce website creation and promotion is a profitable business. You don’t have to own a large company to afford launching an effective trading platform. Let’s talk about the ways of online store creation and the best systems that work best for this purpose. Question #1: Should I Order an Online Store or DIY? When ordering an online store from the third-party developer, you do not only pay more, but you may also have problems in future. For example, web developers often register domains on their names, but not on their clients. This is especially popular with freelancers. What’s more, you won’t know the essence of your eCommerce website structure. Each time you need to edit your website, you’ll have to contact the web developer and pay for these services over and over again. It makes sense to launch an online store from scratch on your own. This approach is more comfortable. If you use the right tool, you will easily achieve the desired result and get the documented evidence of your domain and website ownership rights. You will be in charge of a project, being aware of all the nuances, specifications and details as you’ve developed it yourself. Question #2: Is It Possible to Launch an Online Store for Free? Theoretically, this is possible, but practically, it isn’t. Even if you decide to choose any free CMS, you will still have to pay for the domain and hosting, set it up and track the project status. Apart from that, you will have to spend much time to master it, search for extra modules (they are usually required in Free solutions), edit the code etc. Thus, this is definitely not the best variant for newbies. Such an “easy and cheap” way will bring you to a deadlock, making it impossible to find the right solution. You will just spoil your mood and waste your time. You can also build an online store on a free plan of your favorite website builder, but this is a hasty decision. A user won’t be allowed to connect own domain, remove the system ad banner and also will be limited in the amount of products to be added to the website (these are generally 10-25 products). Access to online payment systems will also be closed and there may be lots of other negative nuances depending upon the platform. You don’t need an online store with poor functionality. So, this variant is not suitable as well. It may work for mastering the features of a website builder, but not more. You won’t find any useful features in a Free plan, which still appeals to many users. What’s the way out then? You won’t go without investing into a website builder. The cost depends upon the platform chosen. It is better to pay for the features and options that will definitely ensure the desired result. There is nothing simpler and more practical for a newbie than website builders. You don’t have to make something up. Just choose a platform from the list of services based on your preferences/financial abilities. Effective and free online store is nothing more than just an impressive myth. The sooner you realize that, the more success you will avail. Optimize your store depending on users behavior. I Have Launched My Online Store, What’s Next? Stay in touch. It goes without saying that you shouldn’t overload your clients’ email boxes with spam messages, but it really makes sense to make mailouts providing information about the assortment updates, special offers, versatile bonuses etc. sometimes. This contributes to a notable goal – to convert a one-time client into a returning customer. Your website development investments may pay off in 2-4 months granted that you choose the right approach. By investing $20000, the prevailing part of which will be spent on buying products, you may get the $6000-$8000 profit per month, offering 500 product items for sale, for example. This is the average profit rate. By using dropshipping, you will save money, when buying products. You’ll have to spend some funds to get the plan of the chosen website builder and further website promotion (contextual advertising, social networks). What Is The Best Way to Build an Online Shop? Building an online store is a challenging task. It makes sense to set aside impractical and inconvenient options, leaving the most suitable one. You will need a nice website builder that will work best for your tasks. This will save much effort and time in future. There are many eCommerce website builders that make it possible to create online stores. Some of them are specialized, while others offer this option with other functionality features. Niche competition is tough here. It may be difficult or even impossible to master all the nuances for a user, who doesn’t have any relation to this business. What are the criteria you should follow when choosing a website builder? How is it better to use it and avoid the unneeded expenses? This may be a problem for you as well, but we have answers to these and other questions. We have prepared our own rating of platforms, in which we will set the priorities in the eCommerce web building niche. Only quality systems that have been previously tested by our team, are listed here. Shopify is one of the most popular services in the world. The system can boast beautiful templates (9 of them are currently free and 45 are paid) and powerful design customization settings. 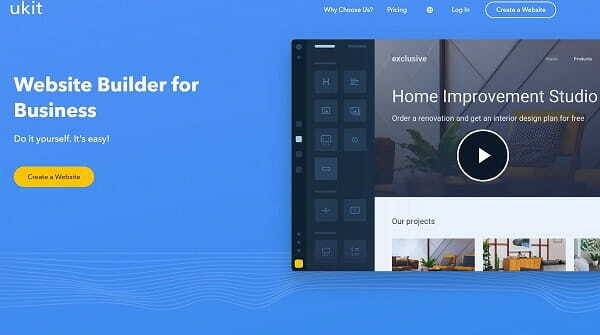 Customization parameters differ in various themes, but they are still very detailed: header, footer, sidebar, fonts, shopping cart and show window design – you can set up all the nuances on your own. There is also code access here. You can even download a website on your desktop and edit as you wish. It should be mentioned that each template can be translated into any language (to replace standard headers), but you have to do that manually. The system interface comes up to this purpose. The dashboard is very similar to those of popular eCommerce CMS like Prestashop or Opencart. It looks simple, but it comes with a rich choice of deep settings. There is also an app store subdivided into categories (sales, social networks, servicing, statistics, marketing etc.) here. Products can be imported from CSV files. Prices are reasonable for a service of this level and start with $312 and up to $3192 per year. Shopify is a decent website builder from all the points of view. If you need a quality online store, this is the best variant for this cost in the contemporary web building niche. 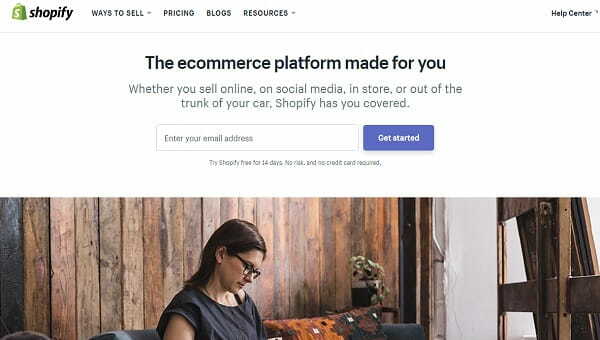 Shopify Website Builder Review – Read the complete Shopify review for more information. Wix is a website builder that comes with the integrated eCommerce feature, offering average functionality. You can create products and their categories, set up online payment parameters, tax and shipping settings, order statistics and other general settings here. You’ll have to upload the products manually as there is no import/export feature, which is a bit disappointing. Instead, you’ll be able to design an appealing show window in a convenient and pleasant way. The service offers 38 appealing eCommerce templates. You’ll understand that it is impossible to get bad result here from the very first sight. You’ll be able to create an impressive and convenient online store to actively sell 100-150 products here. Wix abounds in marketing apps and offers an opportunity to design appealing previews. Shopping cart convenience and general design quality allow recommending Wix to create trading platforms. The website builder is much better than the majority of systems with a WYSIWYG editor available in the contemporary web building niche. The service won’t work for launching a large online store. However, Wix is appealing, convenient and allows building websites with impressive design. This is its major highlight that attracts millions of users worldwide. For example, if you have a small collection of quality clothes, then Wix will work great for its promotion among the target audience. The cost of the “eCommerce” plan constitutes $198/year. The system frequently offers discounts. So, you won’t face problems, if you wish to invest minimum money into your eCommerce website. This is a perfect variant for all those users, who wish to start selling their products without any hassle at all. You will be able to create online stores similar to the Apple platform. They will come with large images, framework change effects, eloquent descriptions and impressive graphics. This is clear, simple and effective. Wix eCommerce Examples – See the real Wix-powered online stores. uKit allows launching online stores in one of two ways: either by using the integrated “Product” widget or by means of the external Ecwid plugin. Both variants are good in their own ways, but they differ a lot, when it comes to working with them. The result you will get, however, is also very similar in quality. The “Product” widget is pretty simple to use and customize. You’ll be able to add the unlimited number of products. Shipping and online payment settings are available here as well. Product card design is customizable. When using an integrated widget, you can add options to those products that will affect the final cost (either fixed or that with the percentage). For example, you can add the upholstery materials, accessories and wood types for furniture. Each product may have up to 3 options with the unlimited amount of variants (like colour options, for example – black, white, green etc.). What’s more, uKit allows connecting SSL certificate for free (the https protocol). Your online store will be protected by the encrypted connection, which will certainly be valued by clients, when making online payments. Generally, the integrated “Product” widget is an ideal option for newbies. Your online store will look appealing, but this solution won’t work well for users willing to create a large show window. The cost of connecting the eCommerce plan constitutes $115,2 per year. Users, who have already got used to uKit when creating business websites and wish to expand the experience by launching trading platforms, will like the way online stores are created here. It is much simpler and pleasant to work with uKit as compared to other website builders. This is a good option for users willing to create a small, but advanced trading platform. 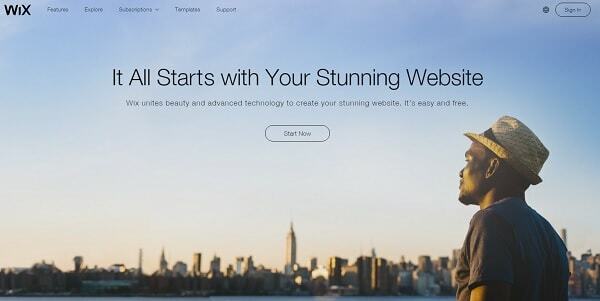 uKit Website Builder Review – See the unbiased uKit review for more information. Prior to starting building your online store, you need to consider all the details concerning the products you will sell, shipping destinations, suppliers, ways of official registering of your website ownership, methods of its promotion, analysis of niche competitors etc. Then you will have to dispel two popular myths for yourself. These are the opportunity of free online store creation and its quick promotion. Be patient from the very beginning. Get ready to invest your money and effort into the project and be serious about your platform design and content. The simpler and more appealing and logical it is, the more chances to get money from your potential clients will be. It makes sense to choose specialized website builders to create an online store. Shopify is a better choice in this case due to the number of features it has, such as powerful general functionality, variety of templates, marketing tools, reasonable cost and power of the system, synchronization with electronic tables and accounting applications. uKit stands out from the crowd as it allows creating an online store in two ways: by means of using an external Ecwid module, which places it on the same level with specialized platforms in terms of power as well as by using an integrated widget. Wix features higher quality. It is more pleasant and convenient to use it as compared to the rest of systems of this class. Templates are the best here. Choose a website builder with regard to your objectives, preferences and abilities. Almost all the systems reviewed above come with free trials that allow exploring their options. Good luck!